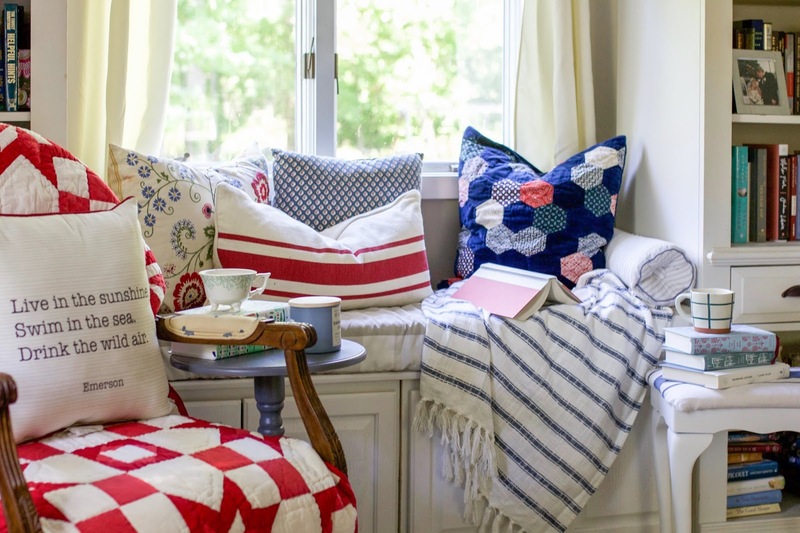 When it come to summer decor, I often crave the addition of more color in our home. I recently switched our bedding back to our patchwork quilt and decided to give our entire room a quick makeover, including adding a light to our DIY window seat/reading nook. 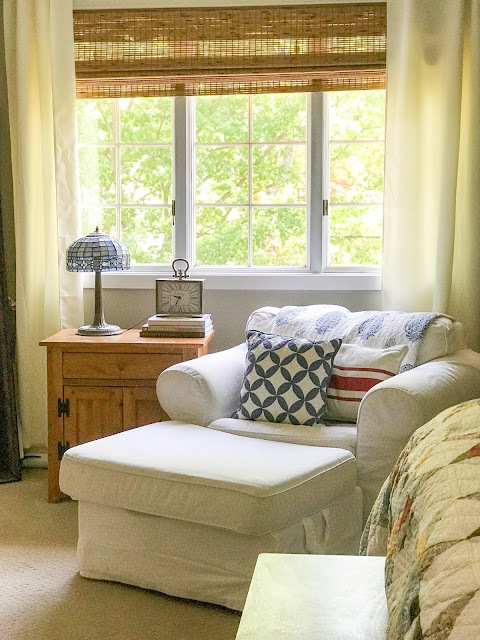 I like to play around with switching up my decor but I will always come back to this country cottage look. For me, it just speaks home in a way that no other style does. I think we all get caught up in trends at times and I certainly never let things stay the same for too long. But I always seem to find myself drawn back to this "homey" style. When looking through magazines and Instagram, I am always drawn to homes that so obviously represent the people that live in them. I hope my home does that. 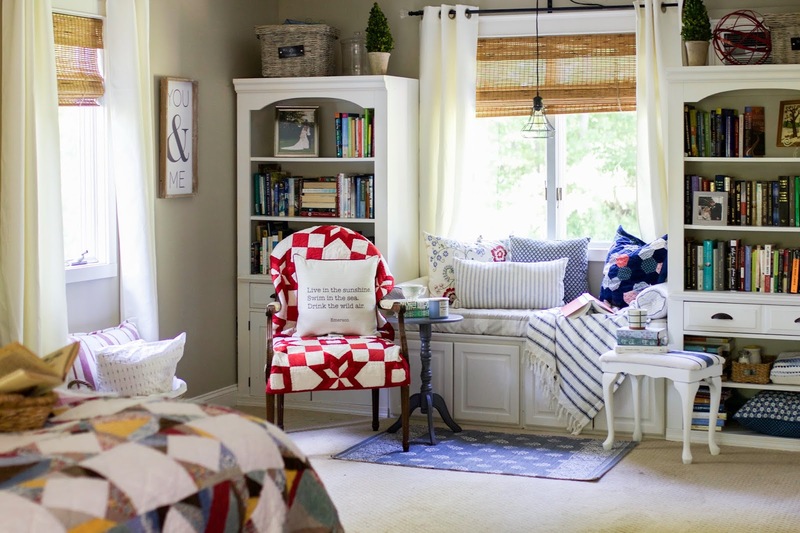 I am a book lover so these "built-ins" create a reading nook on one wall of our master bedroom. These are actually just old book cases that we connected using an in-stock kitchen cabinet topped with plywood as a bench. You can see the entire wall in the picture below. I found the old caged light while spring cleaning one of my closets and thought it would be perfect in my reading nook. I also love all quilted things and found the new navy rosette pillow cover on clearance at Garnet Hill. I used 2 quilted red and white pillow shams from Pottery Barn to cover the chair. 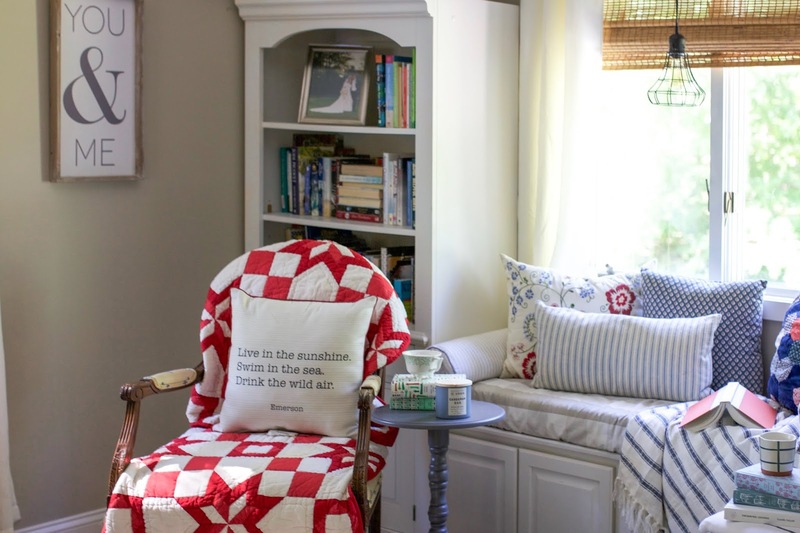 They are simply large euro shams that I placed on the chair and they happen to fit perfectly. This gives the space a temporary new look and I can go back to the yellow fabric that is embroidered with navy blue bees when I tire of the red (which I inevitable will!). Do you also have a personal style that you come back to again and again? Wow!!! All the pops of color are just gorgeous !!! Thank you for sharing !!!! Love all the pretty quilts you have Courtney. Love all the color and cozy feeling they give. I see the fur babies are loving this space too. 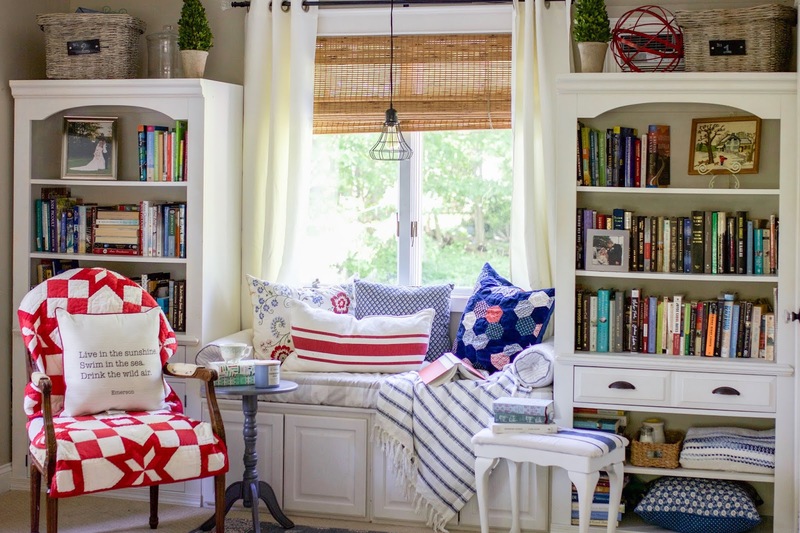 Your reading nook is awesome. Happy Friday. Have a fabulous weekend. Oh, how cozy!! 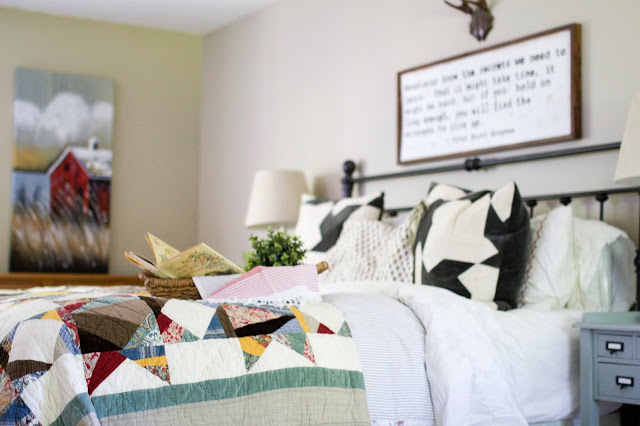 I love the colors in your bedroom & so glad you are one blogger that has not gone crazy with everything neutral & white. So boring!! 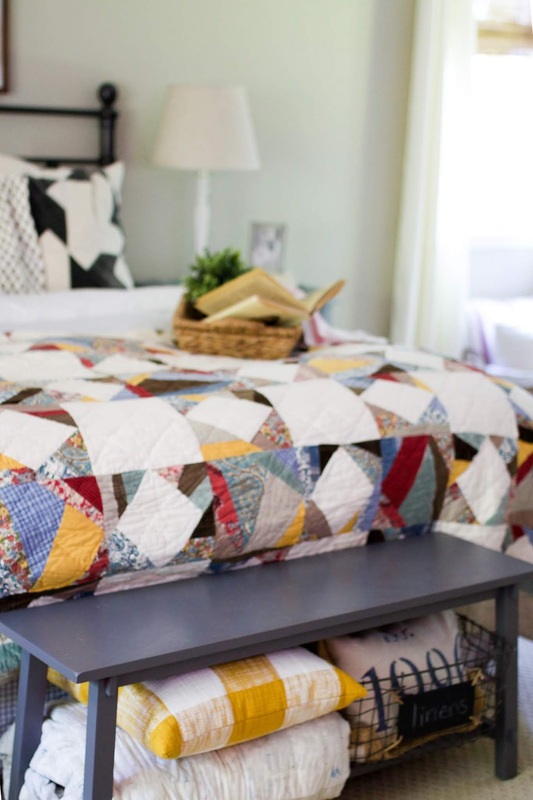 The colors just burst happiness & has inspired me to continue quilting. Thank you for sharing!! 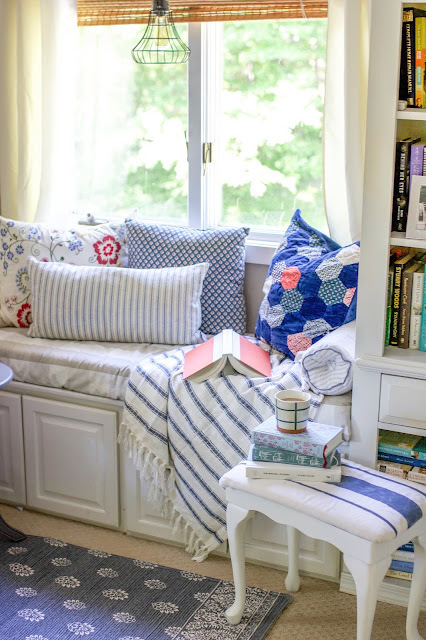 Oh I absolutely love your clever reading window seat idea - looks AWESOME! Everything does!! This is such a great idea and use of space, Courtney! I love that you go back to using what you really love. I've learned over the years not to stray too far from the style I feel is ME! Love everything!! 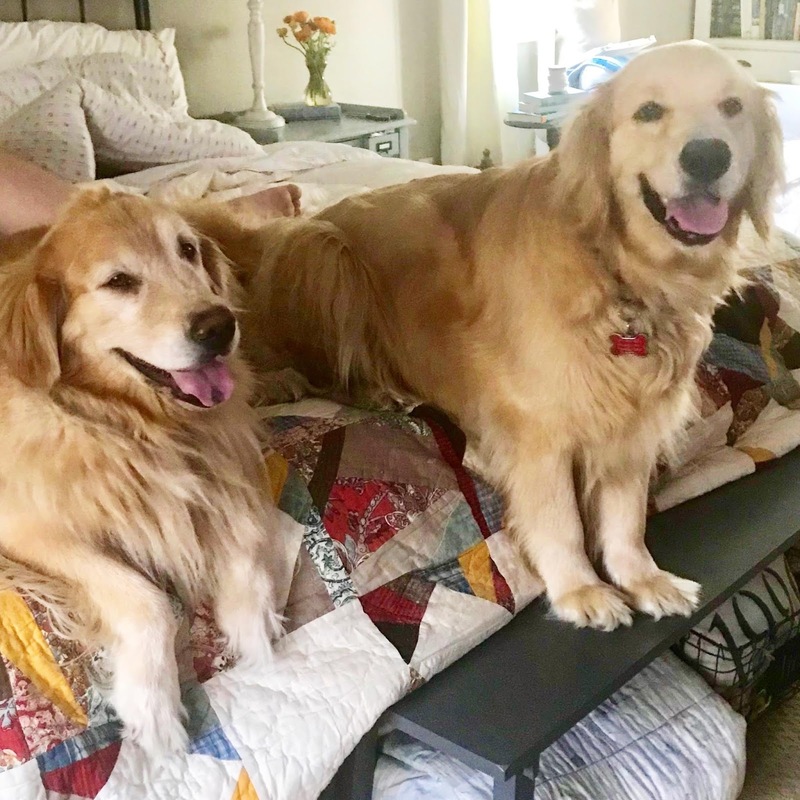 Your doggies are so precious too!! This post and these images have made me so happy! We just bought our first home - a small, very Floridian stucco house. I love it. And I'm having such fun finding ways to make it the cozy and warm home I've always dreamed of. Your post gave me such inspiration! Amazing room! Place for sitting near the window is my little dream. Always when I'm watching american movie, I want sitting, thinking, reading a book on the windowsill. This room is really inspiring.